Posted by Steven Bartus in Turkish Cuisine. When evaluating restaurants, I often like to separate them into those that offer life-changing experiences and those that don’t. I like this categorization because it reflects the transformative potential of a good meal. At its pinnacle, food has the capacity to push our senses to places they’ve never been before. Such experiences are rare; I can think of only a handful during my time in Turkey. But when they do occur, these moments of gastronomic brilliance, your world slows down, turned only by each bite you take. I’ve evoked this life-changing language in several posts over the past few weeks to convey what several places did not offer. This is not a mark of disappointment; it’s unreasonable to go into every meal expecting an earth-shaking culinary experience. Most times, in fact, I’m quite content with good food at a good price. However, there are times when I want to be wowed and money is not a concern. One such time was last weekend. Kosebasi was voted as one of “World’s 50 Best Restaurants” by the 14,000 members of Conde Nast Traveler magazine and was awarded with “International Tourism, Hotel and Catering Industries Prize” as the best representative of the traditional Turkish cuisine. 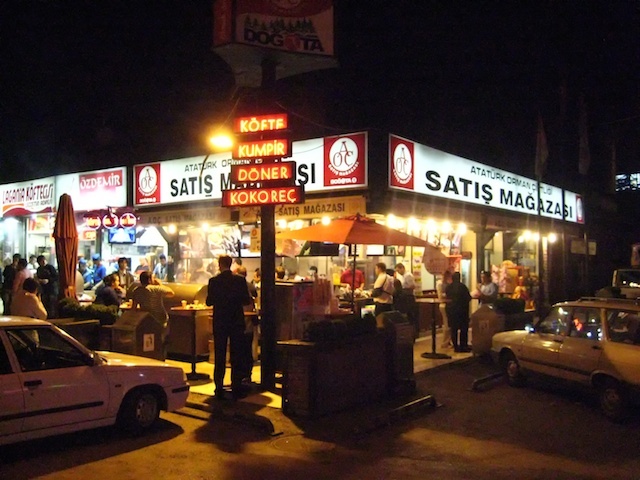 Kosebasi was also cited as “the best kebab restaurant in Istanbul” by Time magazine. Kosebasi’s global fame has received numerous bookings from all over the world and continues to attract many celebrities including Jack Nicholson, Chelsea Clinton, Warren Beatty, Sting, Tim Zagat and Donna Karan. Köşebaşı has several branches in the more chi-chi sections of İstanbul as well as in Ankara and İzmir. It also has expanded internationally to Athens, São Paulo, Bahrain and Dubai. Given this reputation and global reach, I had to venture up to Gaziosmanpaşa on Sunday for a potentially life-changing dinner. Did Köşebaşı offer this superlative experience? The answer, I’m sorry to report, was a resounding no. You might think it takes some hubris on my part to proclaim that Köşebaşı is a decidedly mediocre restaurant in the face of accolades from fabled magazines like Condé Nast Traveler and Time. But I can do so in this case without reservation. The food was simply not good enough to match the acclaim it advertises. Köşebaşı features the ‘traditional recipes of South Anatolia’. Popular offerings like beyti, çöp şiş, kanat, patlıcanlı kebap and lahmacun are all on the menu. Köşebaşı also makes some specialties, such as şaşlık kebabı and terbiyeli şiş, both of which I had not previously seen in other restaurants. Per the recommendation of the waiter, my friend and I ordered these dishes in addition to the spinach salad and spicy bulgar ezme for starters. 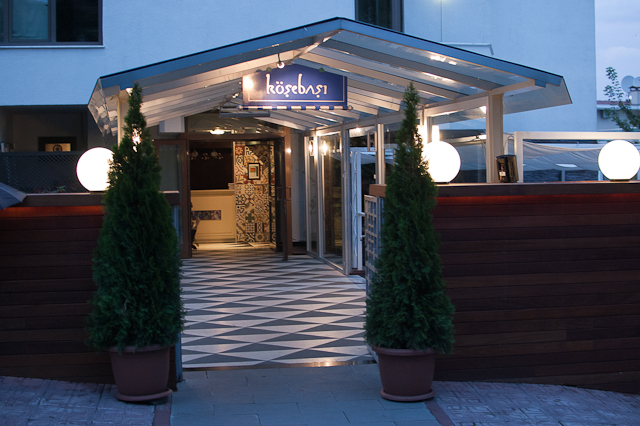 The food at Köşebaşı is not bad, but it’s far from remarkable. The spicy bulgar ezme is exactly what you’d expect: typical ezme with some bulgar and extra spice in it. The spinach salad diverged from expectations only by the inclusion of a few raisins for a bit of sweetness and texture. Our entrées, the most expensive items on the menu, were overcooked and served with a lackluster side of seasoned onions, peppers and roasted tomatoes as well as some generic, straight-from-the-bag lavaş. Simply put, these are not the trappings of one of the world’s ‘top 50 restaurants’. Köşebaşı highlights a long-standing grievance that I have with Turkish cuisine: the insistence on cooking meat well done. No one (except Turks, it seems) wants to eat leather, especially at a purportedly top-quality restaurant. Far too often I regret forgetting to ask the chef for ‘çok kanlı‘ when I ordering beef or certain cuts of lamb. I’m the first person to recognize that there are differences in taste across cultures and these are usually something to be celebrated. But in the case of meat there is no going around it: well done is not acceptable. To end an already sub-par meal, my friend and I ordered the künefe for dessert, which has been recommended to me by several readers. I have long maintained, somewhat snobbishly I’ll admit, that there is no good künefe in Turkey outside of Hatay, the southern city most renown for this dish. To date, everything I have had in Ankara has proven this theory to be correct. Köşebaşı further added to my credibility. This particular offering was terrible. There was an almost negligible amount of cheese in it, accentuating the taste and consistency of the kadayif. How can any respectable establishment serve künefe with such an egregious oversight? I suspect that the original Köşebaşı in İstanbul was (or maybe still is) a very good restaurant. The Condé Nast top 50 ranking (at least the one framed on the wall in the Ankara branch) is from 1999, four years after Köşebaşı was founded. It was likely based on early work by a talented chef that attracted some deserved attention from the press. But in the eleven years since then, my guess is that Köşebaşı’s owners decided to use the notoriety as a basis for an ambitious expansion, first around Turkey then abroad, which ultimately compromised the quality of the food in the name of profit. Now Köşebaşı is best suited for duping rich Turks and foreigners out of their money under the guise of being world-class Turkish cuisine. There is far better elsewhere in Ankara for far less money. Köşebaşı is located on Kuleli Sk. in Gaziosmanpaşa (Google Maps). Prices are upmarket: starters cost around 8TL each while entrées average at 18TL. Alcohol is served. Köfte, like döner, is another ubiquitous favorite of Turkish cuisine around the city, and also like döner, it comes in varying degrees of quality. In the early days of this blog, I wrote about Roka, a köfte joint in Bahçelievler that puts a twist on the norm with a large, table-top salad. Through an email from Başask, I learned that there are more places in Ankara that offer this option. She recommended Köz Köfte in Ulus for an even better version of the offerings at Roka. Yesterday, I finally got around to making to the trip across town and would agree with Başak: it’s definitely better. The formula at Köz Köfte is familiar: a collection of greens and other veggies are spread over the table, doused with lemon juice and topped with roasted garlic and tomatoes. Köz Köfte, though, makes a nice addition with several pieces of çiğ köfte. While I will admit that this particular batch was very much on the average side, it was still a great complement to the lettuce and lemon. You are given three options for your köfte: acılı (spicy), sade (plain) and kaşarlı (with cheese). Given my preference for spice, I went with the acılı. It was fresh and nicely prepared. In particular, I appreciated that it was not inundated with salt. The meal is finished with a serving of delicious helva, which compares favorably to that of Recep Usta and Çukurağa Sofrası. The sentiment that I expressed back in September about Roka and last week about the döner at Süha’nın Yeri is also applicable with Köz Köfte: this is not a life-changing meal. The köfte is very tasty and I like the addition of the salad to the meal, but I still tend to find that the best köfte in Ankara comes from the mobile eateries that I wrote about in January. Although novel compared to the norm, the salad-köfte model remains in need of innovation. It’s not enough to spread a bunch of greens on top of a table. Köz Köfte is on the right track with the çiğ köfte, but why not include some ezme and maybe hummus as well? Without a few additions, the salad will always feel somewhat underutilized. Köz Köfte is on Kazım Karabekir Cad. (Google Maps). A portion of köfte with drink comes to around 14TL ($8.90 at 1.58TL/$). Posted by Steven Bartus in Quick Eats, Turkish Cuisine. Döner kebab is everywhere in Ankara, but the honest truth of the matter is that most are pretty average. Dryness and poor-quality meat unfortunately tend to be all-too-common features in the majority of offerings. For the tiny amount you pay, though, it’s usually bearable and still a sufficiently tasty bite to eat. Some döner, of course, is better than others. In a previous post, I profiled Gülsoy, my favorite quick-and-cheap eatery on Sakarya Cad. They tend to make a good product that is consistent and avoids the pitfalls mentioned above. But in the end it’s still fairly conventional. Süha’nın Yeri is a different story. Their döner is made from veal, an uncommon meat to find in Turkey and certainly a surprise to see in this particular form. The result is delicious and puts a new spin on one of the world’s fast-food favorites. The veal at Süha’nın Yeri is special (or so the manager told me). It is sourced from a particular butcher, and all of the tendons are meticulously removed before it is marinated for a day. The meat is then stacked and rotated in front of charcoal instead of the typical gas flame found in most döner places. And rather than serving it in the standard yarım ekmek, the final product is inserted into a hallowed-out piece of toasted bread. Onion and tomatoes come on the side to be added according to your taste. This is not a change-your-life sort of meal, but the döner at Süha’nın Yeri is undoubtedly very good. I appreciate the innovation on a classic item that, as I said earlier, can be quite average at times. If you ever find yourself tiring of the options prevalent on the streets of Kızılay, I’d give this one a try. Süha’nın Yeri is located on Bestekar Sk. in Kavaklıdere (Google Maps). It is only open for lunch each day, starting at 11:00 and closing usually around 14:00. There was a steady stream of people coming in and out while I was there today, always a good sign in any restaurant. 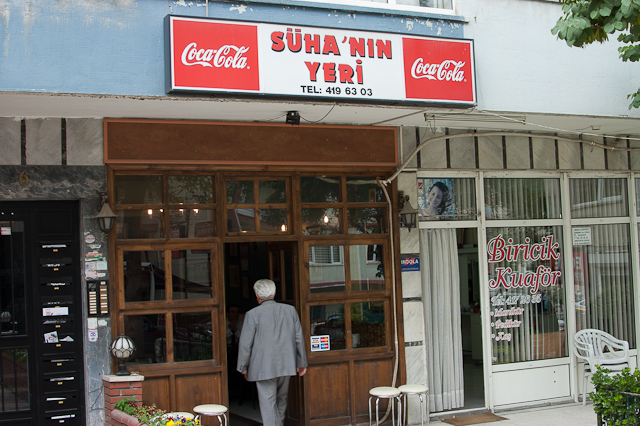 The döner at Süha’nın Yeri, being made of high-quality veal, is much more expensive than normal. One portion costs 10TL ($6.30 at 1.58TL/$). If you’re have a big appetite, you should probably get the bir bucuk size for 15TL ($9.50). Köfte is also served, but I can’t comment on the quality as I have not tried it yet. In my never-ending quest to find the best kokoreç in Ankara, I followed a recommendation from the comments section of an earlier post and checked out Pikolet. At this point in the contest, the competition is fierce: Kıtır and Profesör have been impressive, but the lead is currently being held by Doğata Satış Mağazası in Atatürk Orman Çiftliği. Pikolet performs well against these competitors with some very good sebzeli kokoreç. In the end, though, it falls a bit short of beating them. 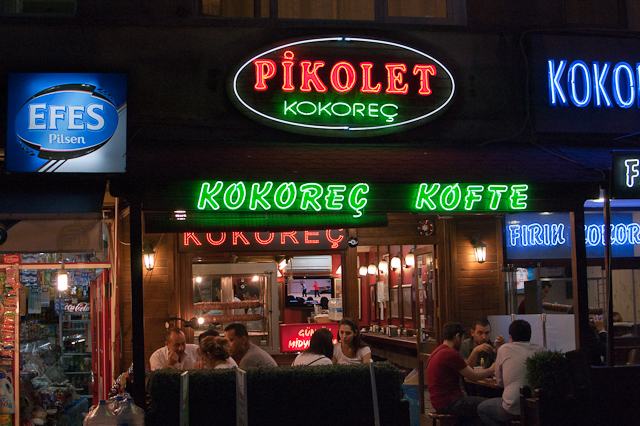 I tend to judge kokoreç based on the balance displayed between flavor and consistency. Good kokoreç will exhibit enough spicing to bring out and complement the natural flavors of the lamb and vegetables without becoming overwhelming. It will also maintain a consistency that is fine enough to avoid being overly chewy while still able to provide sufficient texture in each bite. This balance is not something quantifiable; I can’t say that this kokoreç is 21 percent better than that kokoreç. But it’s the basis I use when judging these places, something I’ve honed by consuming dozens and dozens of portions. I enjoyed the kokoreç at Pikolet. Particularly for the vegetable variety (I tend to prefer the izgara ones), it’s very tasty. However, I’d probably go to the other places mentioned above before returning here. There’s not a drastic different; it’s simply a matter of preference, which ultimately is the final arbiter in taste. You can’t go wrong with any of them, so try each of these places and decide on the best for yourself. In the upcoming weeks, I’m going to be checking out the kokoreç at Rumeli. Although known more for its işkembe, several readers have recommended it to me for consideration in my rankings. Pikolet is located on Gençlik Cad., not far from Düveroǧlu (Google Maps). The other branch of Profesör is also nearby if you want to check out the competition. A yarım portion of kokoreç costs 7TL ($4.50 at 1.57TL/$). Köfte and midye dolması are sold at Pikolet as well. Posted by Steven Bartus in Foreign Cuisine. Over many years and waves of immigration, the United States has transformed pizza into a food that is almost as much American as it is Italian. From deep dish in Chicago to the wide, thin and floppy style in New York City, regional variations reflect the impressive diversity of our nation’s people and their cooking. This culture of pizza-making might come as a surprise to many outside of the U.S., where Domino’s and Pizza Hut have become ubiquitous in promoting their mediocre product. This is certainly the case in Ankara. My friends and I have consumed far too much of this junk-food pizza simply as a matter of connivence and cheapness. Recently, though, our lives have been greatly improved by the discovery of New York Pizza Delivery (NYPD). As the name suggests, NYPD takes its inspiration from the famed slices of the Big Apple. It does proper justice to the original, indicative, I think, of some experience making pizza outside of Turkey. After eating at NYPD this weekend, one of my friends quite aptly stated that they are doing too many things correctly to have learned how to make New York-style pizza in this country. 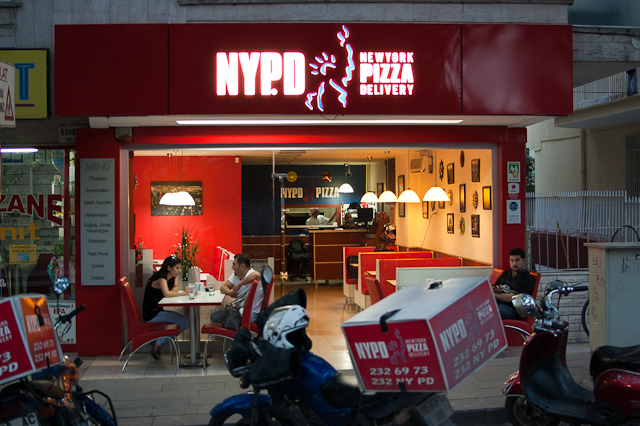 The menu at NYPD is large and features an assortment of pizzas. I’ve sampled the Chinese (topped with mozzarella, curry chicken, bean sprouts, spring onion, garlic, mushroom, carrots and hot sauce), the BBQ chicken (mozzarella, NYPD BBQ sauce, chicken marinated with special sauce, olive oil, garlic and parsley) and the Manhattan (mozzarella, labne, tomatoes, garlic and basil). All are excellent. NYPD also offers pastas, salads, sandwiches and some other Italian favorites. My friends and I tried the Philly cheese steak and the calzone (which is amusingly classified as İtalyan Börekleri, I might add). Both were decent, but the pizza remains the star attraction at NYPD. Definitely try an order of garlic bread, though. In Ankara, both Mezzaluna and Paper Moon make good pizza as well, albeit of a more gourmet, expensive variety. Their pies are examples of a more traditional, Italian style. I certainly enjoy this type, but at the end of the day I’m find myself more inclined to desire the greasy, floppy goodness of a New York City slice at NYPD. New York Pizza Delivery has locations on Gençlik Cad. in Anıtepe and Turan Güneş Bulvarı in Yıldız (Google Maps). Prices are very reasonable. A small pizza, enough for one person, costs around 11TL ($7 at 1.57TL/$), while the larger two- and three-to-four-person sizes come in at about 25TL and 29TL ($16 and $18.50), respectively. The other items on the menu are generally priced at 10TL ($6.40) or under. It’s also worth noting that NYPD (obviously) delivers; call or check Yemeksepeti to see if they come to your neighborhood. As a self-proclaimed connoisseur of kokoreç, it’s a shame that it’s taken me so long to visit Atatürk Orman Çiftliği (A.O.Ç.). Countless Turks have sung its praises throughout my time in Ankara, but I kept putting it off since it isn’t as convenient as most downtown restaurants. After eating at Profesör last week, I promised to make the trip to the A.O.Ç. in order to crown the city’s champion kokoreççi. Yesterday I was able to stop by with my friends on the way home from a wedding in Altınpark to sample the delectable offerings. Let me say this first: the place is absolutely phenomenal. It’s a mecca for kokoreç lovers. About half a dozen different shops are crowded together, preparing their fare and filling the air with the delicious smells of cooking intestine. The mood is set by street lights muted by thick clouds of smoke accompanied by the murmurs of the hungry crowds below. Undoubtedly, it’s not a destination for haute cuisine, but I can think of few better places to eat in Ankara. A Turkish friend who attended the wedding with us directed me towards Doğata Satış Mağazası, declaring that it offered the best kokoreç of the lot. I can’t disagree; it was some truly amazing stuff. From my vantage point, the man preparing the kokoreç did everything correctly: he applied the right amount of spice and chopped the meat to achieve near perfect consistency. With each bite I could taste every flavor that makes kokoreç my favorite Turkish food. It’s certainly not an unreasonable claim to suggest that this is the best in this city. 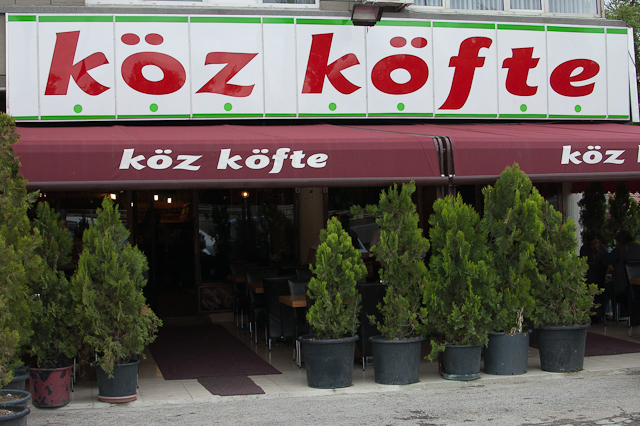 The culinary awesomeness of Doğata Satış Mağazası is not only limited to kokoreç. The köfte is excellent and worth trying. The farm also makes its own superb ayran. The freshness and quality of the ingredients are apparent in everything they make. 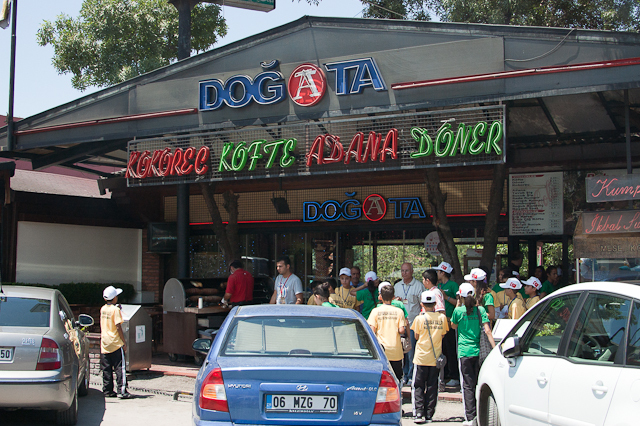 Finally, it’s worth mentioning that the A.O.Ç’s dondurma is an attraction in and of itself. One of my friends went on record stating that it was the best soft-serve ice cream she had ever tried. I would concur. Doğata Satış Mağazası and the other venders at the A.O.Ç. are located on Silhatar Cad. (Google Maps). A large loaf of kokoreç costs a very reasonable 8.50TL ($5.30 at 1.60TL/$). P.S. I must apologize for the sub-par pictures in this post. I didn’t have my dSLR with me at the time and was forced to use a point-and-shoot camera, not an ideal tool for photography in low-light conditions. I sometimes wonder about the distance that would be covered if I lined up all of the lamb intestine I’ve consumed as kokoreç during my time in Turkey. It might stretch for miles. This past weekend I added to this distance with a visit to Profesör. Profesör advertises itself as one of the top ten kokoreç places in Turkey, a status that I believe is based on this 2004 ranking in Hürriyet. According to the article, founder Adnan Zengin incorporates special ingredients from Mersin into his kokoreç and prepares it in ‘hygienic conditions’. Over fourteen years in business, Zengin’s work earned him the nickname that now stands as the name of the restaurant. I will concur with Hürriyet that Profesör offers some exceptional kokoreç. The spicing is dynamic but not overwhelming, and the consistency maintains the all-important delicate balance between substance and texture. It’s quite comparable to Kıtır, although in the end I would give Profesör the edge. However, the title of ‘Best Kokoreç in Ankara’ cannot be awarded until I try the much-praised offerings at Atatürk Orman Çiftliği. I will do so once I figure how to get there without a car. The menu at Profesör also contains midye tava, köfte ekmek and chicken wings. They looked tasty, but the confines of a reasonable meal prevented me from sampling them. 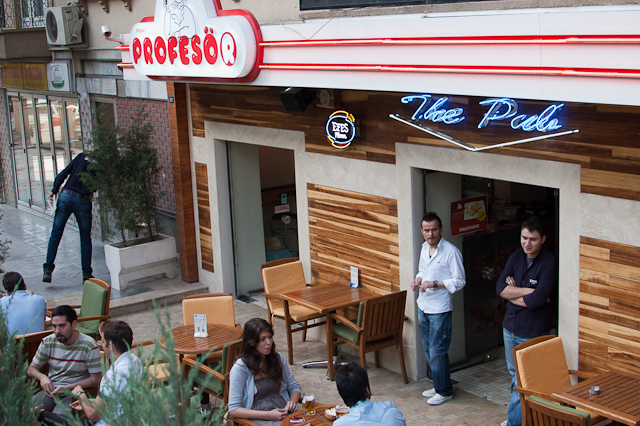 Profesör has four locations around Ankara: Anıtepe, Sıhıye, Kızılay and Kavaklıdere. This review is based on the latter location on Bestekar Sk. (Google Maps). Profesör is on the expensive side; a portion of kokoreç costs 7.50TL ($4.75 at 1.59TL/$). Alcohol is served.